Course lecturer, Thomas J Dimech, delivering his talk during a co-lecturing seminar held for first-year students on the BA Business Enterprise course within the Institute of Business Management and Commerce at Mcast. 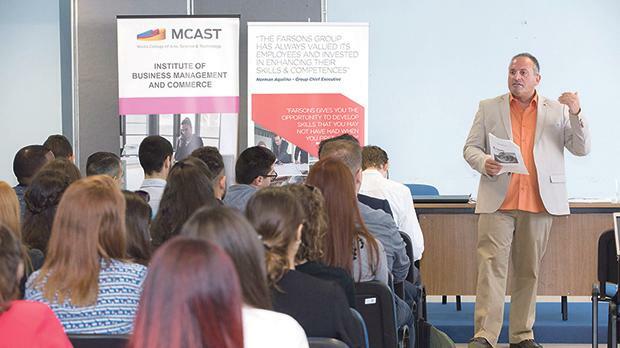 Farsons Group has recently collaborated with Mcast on a co-lecturing seminar for first-year students on the BA Business Enterprise course within the Institute of Business Management and Commerce. This seminar was held on the initiative of course lecturer Thomas J Dimech as part of a series of co-lectures that bring the industry closer to education, with the aim that students get both the academic and the industrial perspective in practice in their fields of study.